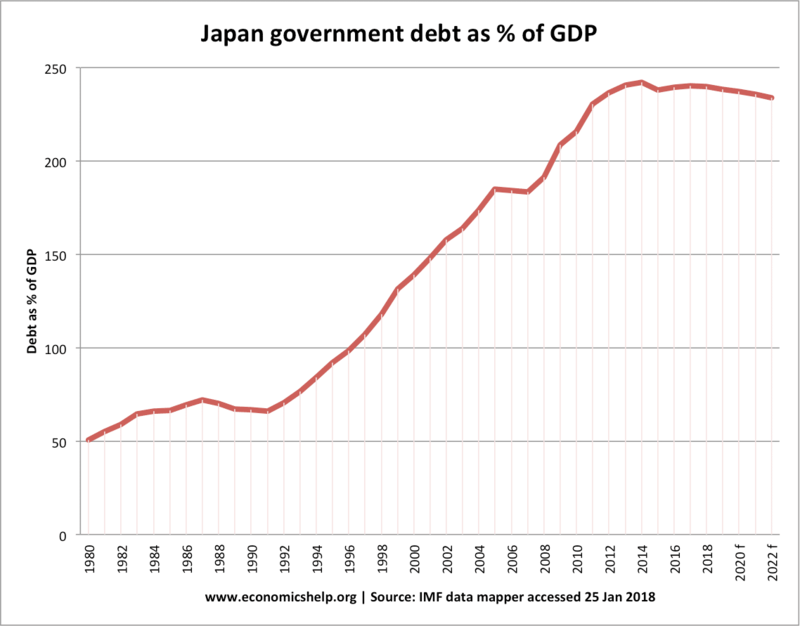 Readers Question: Has Japanese government debt always been so high, or is this a recent phenomenon, caused by the high public spending during the country’s ‘lost decade’? But, also the sluggish growth has meant debt / GDP ratio has risen. 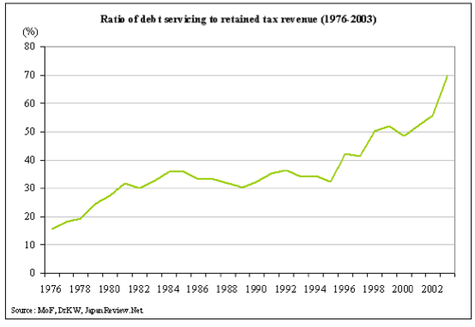 Also, the cost of servicing national debt is placing a great strain on any attempts to reduce debt. I have seen various figures for Japanese national debt, depending on which measure you use. But, national debt in Japan is 225% of GDP (2011) – more than twice the US and is a much more serious problem than many seem to think. 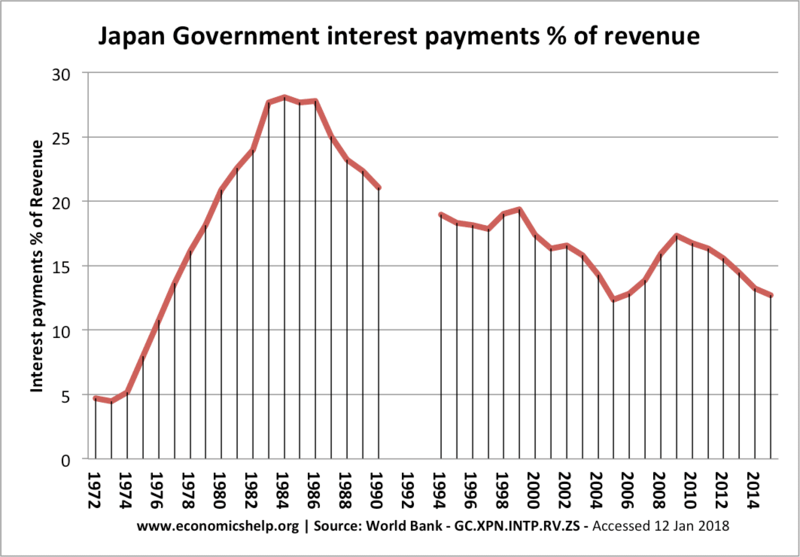 How long can Japan continue to fund such massive deficits? 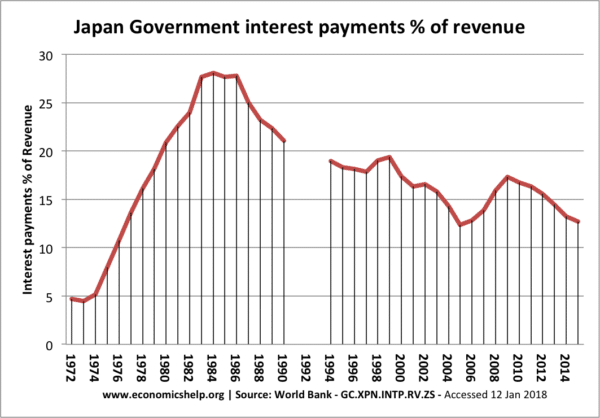 This graph shows how the cost of servicing Japan’s National debt has increased since the 1970s. It is a salutary reminder of the cost involved in a large public sector debt. The cost would be even higher if interest rates were not so low in Japan. (i.e. Cost of servicing National debt = interest payments + bond redemption + administrative costs) as a percentage of the central government’s retained tax revenue (=tax and stamp revenue – local tax transfers). Hi just little bit confused on the figure you use. Sometimes you mentioned that Japan’s National debt is 195% of its GDP and here you quote it as only 130% twice the size of US economy? Yes, I’ve seen different figures. e.g. The 135% was from an outdated figure in 2001, so I updated. There can also be different ways of measuring outstanding public debt. Since its entry into the Eurozone in 2001 Greece has been drifting into the strong currents of river euro to its downfall. The river cannot be turned back. Here and now, Greece must exit this river and return to the calm waters of its own drachma that has carried Greece gloriously over the centuries. After all the drachma was invented by the ancient greeks and the modern greeks will be better off to listen to their ancestors and not to the German sirens that have become now the skylla and xarubdis of the IMF and the Eurofin. George, if greek debt is denoted in EUROs, reimporting the drachme as a national currency isn’t going to do much good. With a sure devaluation of the drachme relative to the EURO, debt would only rise.